Damn Arbor: Contemplating "Up North"
Somewhere as you drive up 75, you go from being "down state" to "up north." Where does that change happen? Is it at the Bridge? The northern range limit for the hickories? The imaginary line the DNR uses to divide the Lower Peninsula into the "Northern Rifle Zone" and the "Southern Shotgun Zone?" Gentle readers, what do you consider "Up North?" Up North has nothing to do with where you are physically, but where you are mentally. I don't care if you drive south west, as long as the beer is cold, camp fire is hot, and you can clearly see how dirty the euchre cards are....then your up north. As the previous commenter said, it's a state of mind. For me, it's where my stress levels are at zero. As I am driving up I-75, I usually start getting into that up north state of mind somewhere north of Flint. YMMV. Somewhere around the exit for Houghton Lake and Cadillac there's this sudden stretch of freeway where it's heavily treed on both sides. I think there's a stand of birch trees? That always feels up north to me. My family used to take 27 up north quite a bit, and you get a little bit different view of the landscape. My dad always said we were north when we started getting those rolling, glacially-formed hills. For some reason there's a more visible change in those when you're on 27. When I was a kid commuting back & forth from the UP to southern MI, there was a crooked old pine tree near 27 just north of Clare. My mom always used to say that was the beginning of the north country. Actually, it was still there when you were a little kid. Hrm, before college, I didn't know "up north" was a thing. It took a few years before I even would admit that anything under the UP was "up north." ALSO: if you meet anyone from the UP, they will laugh a horrible, all-knowing laugh if you describe anything south of the bridge as up north. I still feel funny calling anything else up north. It's a lie! You said it. I know it's east/west, but I even have the same feeling about anything east of Marquette. If your heading up on the east side. Right around standish the trees start in in the center separating the north and south lanes of the highway. 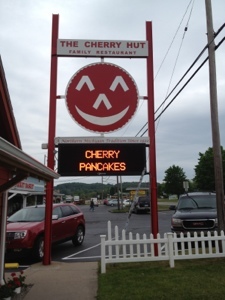 I LOVE the Cherry Hut! I haven't been there in ages but as a kid I got their chicken pot pie and tried to eat two slices of pie in one go. Amazing pie! Best cherry pie, hands down. Bridge or bust. Having lived in the Yoop for 5 years I can never consider any part bellow the bridge "North".